Bookworm Boutique: Interview with Korrina and Robert from OwlCrate! Interview with Korrina and Robert from OwlCrate! For those of you who don't know, I've had the privilege of getting to know, and work with, Korrina (co-owner of OwlCrate) since early this year, and I thought you guys would enjoy a little interview about OwlCrate, Korrina, and Robert. I tried to ask questions that I felt you'd be most interested in knowing the answer to, I know I've had a lot of behind-the-scenes questions before, so I included as many as possible! The above photo, and all other photos in this post, belongs to OwlCrate. Below this interview will be something super special that the team behind OwlCrate have never offered before, so make sure to be on the lookout for that! 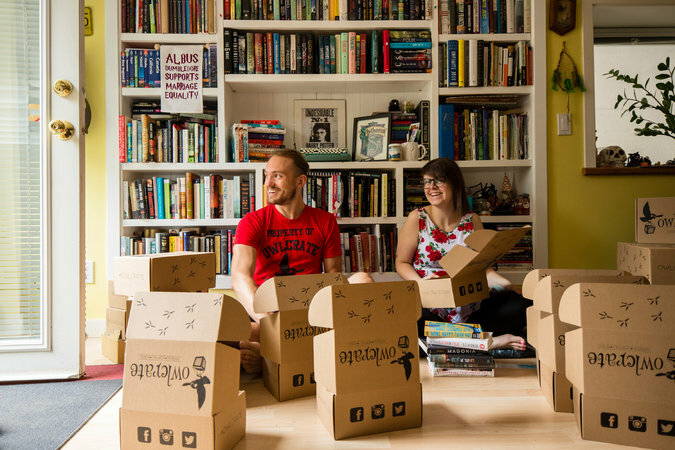 For those of you who don’t know, OwlCrate is a YA based subscription service, each month the owners Korrina and Robert curate a box based around a certain theme. The box contains one hardback newly released YA novel, and 3-5 other bookish goodies. A lot of the time they also include bookish swag, like pins, posters, signed bookplates, letters from the authors, etc. I’ve heard nothing but great things in terms of reviews of OwlCrates, everyone who receives a box (including myself) feels as though it’s like Christmas come early! One of the things I love is that the items included aren’t just run of the mill bookworm items, but they can be adventurous like Thinking Putty and scented beads. Now! On to the interview! Let's learn some basics about the business, OwlCrate! What made you decide on the name OwlCrate? Once we had decided on offering a monthly book box, we knew we wanted to pay homage to the world of Harry Potter and how wizards have their mail delivered via owl. We tried a few different names but it didn't take us long to decide on OwlCrate. Where did the idea for OwlCrate come from? Who, if anyone, helped you bring your idea to life? We had wanted to start our own business for years. We decided we needed to make a change in our lives, so we took a week off from our retail jobs to create a business. Korrina was leaning towards opening an online store selling items for book lovers. Once we started brainstorming though, the idea of a subscription box hit us like lightning. After we had decided on offering our services that way, we knew we wanted it to be about Young Adult fiction and everything flowed from there. It was a true partnership, with both of us forming different aspects of the business. What is the selection process you go through when choosing a book and a theme for OwlCrate? Book first, or theme first? The book always comes first. The book is the most important part of our box and we take the selection of the book very seriously. Many months in advance we look at which books are publishing in the future, we read advanced copies, we look at a lot of early reviews, we consider which books readers are anticipating the release of, and we take into consideration which books the publishing companies are excited about as well. We take everything into account. Once we decide on a book, we then work on creating a theme around the book. What are some struggles that you've faced? We've been very lucky with running OwlCrate so far and haven't come up against too many issues. In the early days we struggled with how many boxes to offer each month, and we could never meet demand, as there were only so many boxes the two of us could pack and ship ourselves. Making the decision to hire a company to help us pack our boxes was life-changing, and allowed us to open up our service to thousands of eager bookworms! What have been the best moments while running OwlCrate? The best moments have always been connecting with other readers. We receive so many wonderful emails, comments and posts about what our boxes mean to our customers and it makes our hearts nearly burst with happiness. The entire reason we wanted to have a business like OwlCrate was to bring joy to people, and to inspire people to keep reading. We're also so grateful for all of the people OwlCrate has brought into our lives - customers, other small business owners, creative people within the book community, authors...it's truly the best community to be a part of! Which box was your favourite/the most fun to curate? What has been the best part of your OwlCrate journey so far? On a very personal level, the best part has been seeing that running a business is something we could actually do. It's always been our dream to work for ourselves and the fact that we're now working on OwlCrate full-time, in less than a year, is mind-blowing. We can never express how much it means to us that people believe in what we're doing. We also just love being able to be a force within the publishing world, and to keep the love of reading alive, in some small way. Do you have any exciting plans for OwlCrate that you can share with us? Yes! In the next year we hope to become more active in the book community by attending more festivals and conventions (beginning with YALLFEST this month!). We're also hoping to expand the types of boxes we offer. We'd love to be able to begin an OwlCrate service for younger readers if the demand is there! Now let's get the chance to learn a bit about the two wonderful people running OwlCrate, Korrina and Robert! What did you want to grow up to be when you were younger? From a very early age Robert always dreamed of becoming a pro wrestler. Korrina was a weird mixture of wishing she could be a dolphin trainer or owning her own company. Have you always been a bookworm? Robert's mother taught him to read when he was about four years old and he's been a reader ever since. Korrina has gone through different phases in her life where she was obsessed with reading, than would take a break, before picking it back again. But in the past 7 years she has read voraciously. What's your favourite genre of books to read? Robert's favourite genre would have to be contemporary adult fiction. Korrina's would be contemporary YA fiction (but she's been enjoying delving into fantasy a lot these days). Do you have an all time favourite book? Robert doesn't have one favourite, but he really enjoys books by David Foster Wallace and Jonathan Franzen. Korrina's favourite books, besides the entire Harry Potter series, would have to be both "Extremely Loud and Incredibly Close" by Jonathan Safran Foer, as well as "The Perks of Being a Wallflower" by Stephen Chbosky. What are some of your bookish pet peeves? Dog-earring pages really gets on Robert's nerves. Korrina's biggest bookish pet peeve is when people say they either don't like reading, or don't have time to read. Those people just haven't found the right book yet! OwlCrate have been generous enough to give me a coupon code to share with you all (this is the first coupon they’ve done, so don’t pass it up!) At the checkout, add the code BOOKWORM10 and you’ll receive 10% off your order. The coupon code will only work for first time subscribers, or current subscribers who are purchasing gifts. The coupon code is good for the rest of the year, so I'll make sure to advertise regularly. Be sure to follow OwlCrate on all their social media, as they update regularly with sneak peaks, theme reveals, customer photos, giveaways, special deals and more! That's it from me! I hope that you enjoyed this interview, I'm definitely hoping to do more things like this in the future, so be on the lookout for those, don't forget to subscribe so you don't miss anything! Remember, OwlCrate has never offered a discount before, so if you've been holding back on ordering or haven't had the chance yet, take advantage of this great offer and join the OwlCrate family!